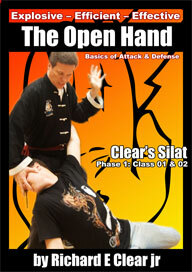 Clear’s Silat first few classes tend to be about Open Hand Techniques. First Open Hands for Defense is taught and then Open Hands for Offense. It does not mean that we would use them defensively or separately most of the time. I have found that it is just simpler to teach and for the student to learn when approached in this manner. So, to begin with I will explain some of the basic value of the Open Hand Techniques as compared to a fist. Relaxed Open Hand Techniques cover and contact more surface area than a punch. One benefit of this is that more of the power of an open hand strike will be delivered to the target. 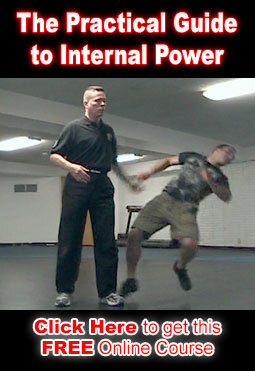 A punch will tend to slide or skid on contact which means less power is being delivered. Open hand techniques tend to transmit less blunt trauma (unless specifically directed to do so as in a palm heel strike) but tend to transfer shock much more easily. Hitting the head with a blow that transmits shock inside the head almost always results in a knockout blow to the recipient. Open Hands are much less likely to get injured when punching a hard object such as a wall or someones head. When throwing a punch Knuckles and other parts of the hand are often broke due to impact and the hard nature of most punching methods. Open Hand Techniques lend themselves to a greater amount of versatility than a fist. An Open Hand can easily become anything such as a finger jab or a grab or even a fist on the way to the intended target. A fist can almost exclusively be used as a fist and is at the very least awkward for most people to use as anything else. With a little training the average person can easily and rapidly throw 3 full ballistic speed and power Open Hand strikes (like playing the bongo drums) in under 1 second and can maintain it for at least 20 seconds. That means a minimum of 60 full power strikes in under 20 seconds with versatility and reasonable choice of where to place the hit (again like hitting the bongo drums). There are very few if any punchers in the world who can match this speed and power with their punches (including professional world class boxers) and when the punches are thrown this fast there is no versatility. All of the punches must be to a small target straight ahead.